Your pet’s initial Reiki session will begin with a discussion about your pet and his or her current state of being. 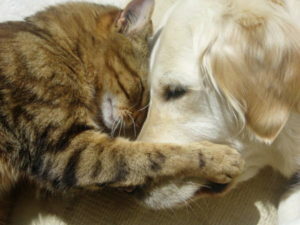 The purpose of a Reiki session is to help the animal relax and/or assist in the healing process. Permission is asked of the animal to ensure they are open to treatment. It is suggested that the animal be with their owner and in a room they are comfortable with. Having a favorite toy and bed in that room is helpful to the process. Energy will be sent to the animal from a short distance away. Once the animal approaches they will receive a hands on treatment which may also include acupressure if the animal is open to this. If the animal is not comfortable receiving hands on energy, energy will be sent from a distance so the animal is at ease.